In which I make the national news for something silly. Again. It has come to my attention today that I've been included in an AP article being picked up all over the country. It's not about my writing, my books I've spent years creating, NO, OF COURSE NOT. It is, like last time, about a moment of online frivolity, and, once again, is not representing my original post quite accurately. And you will kindly notice, if you have eyesight, that my ballot is EMPTY in that photo. I would not go posting my filled-in ballot. That's just tacky. 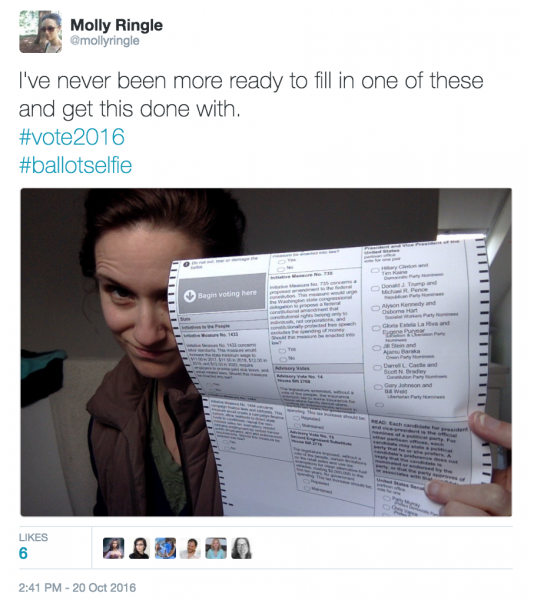 Nonetheless, some of the versions of the article, such as this one, say stuff like, "They're posting selfies on social media with their completed ballots," followed directly by the link to my tweet. UGH. NO I AM NOT. Would you LOOK before writing the article, please. But, in any case: go vote, my fellow Americans. I've had someone on my timeline (who has worked as an election judge) going on about sharing pics of your ballot, and so I definitely did a double-take at your tweet. I noticed you had not yet filled it out! So I scrolled along on my merry way. I'm sorry that others were not as willing to look before speaking. I will be voting on election day, as there's no early voting in PA. I took the next day off work to recover and prepare for what comes next (regardless of the result, SOMETHING will come next). Yeah, there's been poison splashed all over with this election, and it's going to take some time to wear off. I think we can all agree Thanksgiving and the associated gathering together of relatives should not have to come so soon after election day. Sigh. Such is the apparent lunacy of this election that the media can't, apparently, distinguish between an empty ballot paper and a completed one. Nor can they identify one of America's best authors...apparently. Dean for Emperor - he has the right attitude. :) But indeed, sloppy and/or hysterical and/or alarmist media is all too common, and more so than ever during this election cycle. I doubt I would be an benevolent Emperor. There's at least half of your country people who need some serious time out in the naughty corner. Around half of us would agree with you on that, lately. It's a divisive time and it's taking some effort to stay kind and compassionate.